I am not trying to stir controversy or debate. This is not an anti-anything blog post. Because I love all of the school options available these days. I have the utmost respect and admiration for my friends who home school. I've sat in their homes during school days and been amazed at all their kids are learning. I see the bonds formed in their families and the benefits to home schooling. I love the home school and private school blend, such as Corem Deo. I've seen friends whose children have thrived in this model where they are partially home schooled and also attend classes a few days a week. I love the incredible private schools in our community, where students are challenged and taught with a great education and also given a strong Biblical foundation within the classroom. 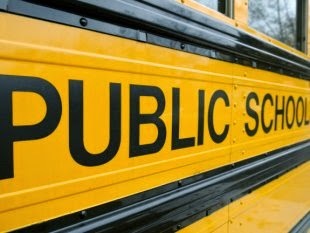 I just want to say that I have not settled nor forsaken my children because we have deliberately chosen public school. We have prayerfully considered our options, being open to all of them--every year, for every child. Believe me. I have truly prayed innumerable times about what the best choice is for OUR family. And I have shed tears and felt the need to defend our choice. So, yes, this post is called in defense of public schools. But, really, what I want to say is that I should not have to defend my schooling choice for my children. Because we are all doing our very best to make the right decisions for our own brood. And no one knows what it is like to parent the children in our homes except maybe our spouse. So, my goal is not really to defend my schooling choices. But to express a greater desire for grace on each other when it comes to this topic. Can we all just applaud each other and cheer each other on and say, "Whatever your choice, I've got your back! I see you seeking God in this decision!" What if we could expend our energy throwing ourselves into the prayerful choices we've made and help each other along the road? Back in my day (yes, I'm pulling out my middle age voice now), I didn't have choices. I was an Army brat attending whatever school was near wherever Dad was stationed. Yep. That meant that I spent hours a day in H.E.P. That would be the Hawaiian English Program. Highly effective on an Army base on Oahu where--oh hey!--we all spoke English. In case you were wondering, Hawaiian public schools were ranked 49th at the time. (This was back in the 70's). Then, we moved to Iowa. Ranked #1. Yes, I survived some flip flopping on the quality of my public school education. So, here's where I land now. My husband and I deliberately bought a house in a great school district. Near really awesome private schools. And also accessible to incredible home school options. And thus far, our children have always gone to public schools. They have been educated by dedicated and hard working teachers of excellent caliber (with a rare exception here or there). Public school teachers and administration are not in it for the glamor or the ease or the pay check. Lest anyone think differently. No, my kids are taught by people who are motivated by their love for children. It's what causes them to work 100 hour work weeks and go up to the school on Sunday afternoons and use half their paycheck for classroom supplies. It's why they get up, day after day, to do it all again and try to guide and teach and lead these children who we place in their care. Because they don't take that lightly. My children have been taught by teachers who have prayer walked their rooms. My children have been taught by teachers who have pulled my children aside and reminded them of the Biblical standards with which we are attempting to parent. My children have been taught by teachers who pray for our family when we've faced various troubles...letting me know this with a phone call or an email. My children use their moment of silence daily to pray. (Let's just pretend this happens EVERY SINGLE TIME). And time after time, my children have used various assignments to express their faith and their love for Jesus. It makes me tear up when I walk the halls and see their bold declarations posted for all to see. But let me be clear. We don't send our children to public schools to be missionaries. We don't tether them to some huge obligation. We do, however, remind them that as long as believing people attend and work in public schools then God will always be in public schools. And there, we encourage them to take opportunities to be his light. Not to fulfill some quota, but just to point to Jesus as they walk their roads. By showing love and grace and letting his light shine through them. Because isn't this how we all want our children to learn to live, as followers of Christ? We encourage them to choose kindness and embrace the chances to meet kids of all faiths and all backgrounds. We love that our children have friends who are Muslims, Jews, Hindus, or with no religious background. We love the diversity of public schools. I gotta chuckle at how young the newest elementary parents look to me now--with their waist long dreadlocks and tattooed arms. We are all learning to not stereotype. We love that our children are learning how to dwell peacefully with all kinds of people. It's not WHY we choose public schools. But it is a fringe benefit. Bottom line, it's just that time after time, we always keep landing back on the excellent public schools in our area. That is what is right for my children. That doesn't mean it's right for your kids. But can we all just still get along and not let this choice be divisive among us? I would just love for us to quit letting school options become something we tear each other down about. At this point, I have not yet found a Biblical mandate that points to any choice being sinful. I do know that I am to teach His Word to my children as we walk the road and as we sit and as we stand. And for us, that road we walk has led us through public schools. So, no matter what schooling choice we make, my wish and goal is for world peace. Just like some beauty pageant participant. World peace, people. Parenting is hard enough. Our children face daily struggles. We don't need to add to each other's burdens. Let's quit calling home schoolers weird and private schoolers sheltered and public schoolers heathens. Can't we just hold hands and join arms and sing Kum-Ba-Ya? Let's just call them treasured and cherished and the hope for the future. Oh and hey--how about you hug a teacher today? No matter where they teach. They could use our love and support, too.